All of which goes to show that psychology and psychiatry are nothing more than politics masquerading as science. My interpretation of the "in remission" part is that if someone has ever met criteria A and B, they have the "disorder" rather than only if someone presently meets both criteria A and B. Of course, the only way you can say someone who presently does not meet criteria A and B meets the diagnosis is by ignoring the actual text of it. On this point, I think we are in agreement, but I hadn't expressed myself clearly enough on my blog. I take "in controlled environment" to refer to people in prison and people in psychiatric hospitals--that way, the paraphilias are by definition incurable. This would support the pretextual way they are used in sexually violent predator commitment. there are many men who report that crossdressing was once sexually arousing but that it has ceased to be so, and these reports may be accurate (especially if one holds a narrow view of erotically motivated behavior as behavior that is necessarily accompanied by penile erection). The DSM-III phrase at least initially in the course of the disorder avoided the absurd possibility that a man could outgrow the diagnosis of transvestism in later life simply by failing to experience (or attend to) sexual excitement when he cross-dresses. This was a more nuanced formulation than that used in later versions of the DSM. He suggests keeping the diagnostic criteria the same, but making a comment in the supporting text that would contradict the diagnostic criteria. Actually, all science has its own politics and all scientists are -- like the rest of us -- normal human being with their own agendas. But good scientists are aware of this and make use of the scientific method to counteract such tendencies. In this case, they fail completely. Thank you for this clarification. It is very useful.For a process that is supposed to be transparent, open and inclusive, I must say the texts are amazingly hard to interpret for outsiders. For a process that is supposed to be transparent, open and inclusive, I must say the texts are amazingly hard to interpret for outsiders. This is a really huge problem given the fact that the DSM is supposed to be useful for educational purposes. Just wanted to say how brilliant I think your blog is Jack and to plug my own blog which I set up the other day. I've also adopted the term 'crossdreamer' if that's ok with you. My blog will be some of my own personal musings on the nature of autogynephilia as well as just a place for me to store my links. I will likely be commenting on some of your posts here in my own blog and referencing some of your posts if you are comfortable with that - particularaly issues such as the Shy Male which I found really interesting. 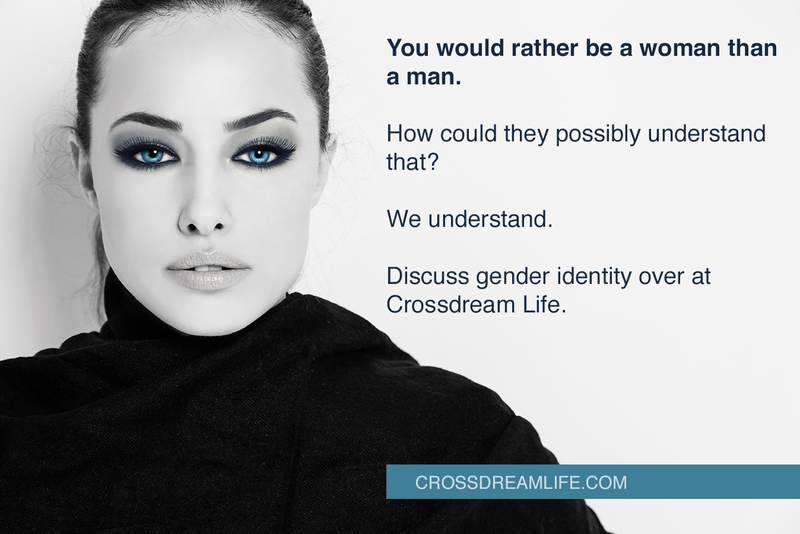 Please tell me how a woman can cross dress if women in general are allowed to dress in any form they wish without an identified of gender. What identifying article of clothing would a women wear that would categorize her as a crossdresser? WOW! Talk about being politically correct. Sean again, have to get a Google account, in response to Oran. It may take a woman a bit more effort to crossdress, but it is hardly impossible. Use of fake beards/mustaches are a common signifier, specific selections that are far more common on men even if available to women, gestures and voice choices common to men. Hair cuts and stances are common ways to alter a gender perception. Habits like cigar smoking or tobacco chewing are often done in gender specific ways. The point is that a man can easily be determined to be attempting to adopt another gender role strictly on clothes, for women, crossing the gender line requires dressing the part AND adding in some other signifier. The therapists and researchers are missing the point if they focus on the clothes to the exclusion of the adoption of other signs of another gender's role. Go to a drag king show or watch Wild Orchid to see some examples of both poorly done and well done gender crosses by women. Hell watch some daytime talk shows, the topic comes around a couple times a year. Are you trying to say that there is no one who is extremely sexually turned on by wearing women's clothes? And that they are sexually excited so much and so often that it cripples or destroys their life? The same thing applies to autogynephilia or crossdreaming... What if it is so intense that it seriously screws up their life? "Are you trying to say that there is no one who is extremely sexually turned on by wearing women's clothes? And that they are sexually excited so much and so often that it cripples or destroys their life? " Nope. There are those for whom crossdreaming becomes crippling. But I guess that is what might happen if you are left no natural outlet for your sexualty or your real identity. But if this is the case, it is not crossdreaming that IS or causes the disease, but the lack of recognition, understanding and respect. This whole topic is ver sad. The real problem is that psychiatry is masquerading as a science. Their is little scientific about it. If cross dressing is a disease or disorder then what is the cure? Doctors are supposed to make people better when they are sick. Psychiatrists do nothing of the sort. They are a sad joke and pathetic by definition. I cross dress full time as a girl, I am happy, well adjusted, have a good job and a loving partner. By what definition am I mentally ill? Blanchard is the type of researcher that is good at categorization. There is nothing wrong in that. Good science requires a thorough discussion of typology. The problem is twofold: (1) He never questions the underlying premise: Deviation from the norm is bad. (2) He never really tries to explain what causes the condition, nor does he have any suggestion for therapy. My understanding is that prettymuch all DSM disorders have some kindof '...and the disorder must cause significant disruption to the person's wellbeing and/or ability to work' disclaimer included as part of the diagnosis. So basically if it's not a problem to you, then it won't meet the medical community's definition of a medical problem. But like Robyn P touched on: for some rare people the effect on their lives could indeed somehow be THAT bad, and for those rare cases the medical establishment is willing to help.